In 2004, I happened to be in Dallas, Texas for a science fiction convention. Before leaving town, I decided to visit Dealey Plaza, the site of the 1963 assasination of President John F. Kennedy. I went with a purpose in mind. Ever since I was a kid, I'd heard the conspiracy theories about the assasination: the Cubans did it, the Mafia did it, the military did it, there was more than one shooter in the Plaza that day... lots of mystery, tons of speculation, and all of it confusing. The X-Files and the movie Kevin Costner movie JFK just made things more mysterious. "...a mystery wrapped in a riddle inside an enigma...." I knew I had to see things for myself. You can read books on the subject, you can examine diagrams, and you can go over photographs, but nothing beats visiting the scene of the crime. 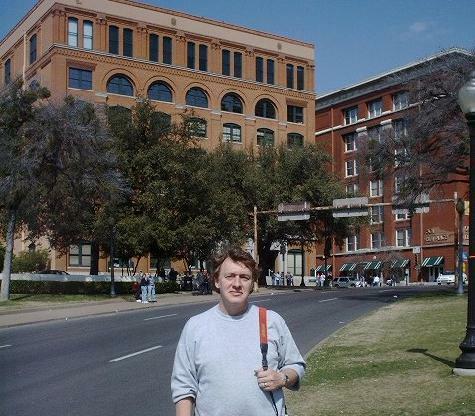 It was a bright, chilly day in February when I arrived in Dealey Plaza. The streets aren't blocked off; you can still drive right down Elm Street, just like Kennedy's motorcade. Thousands of people visit every year. 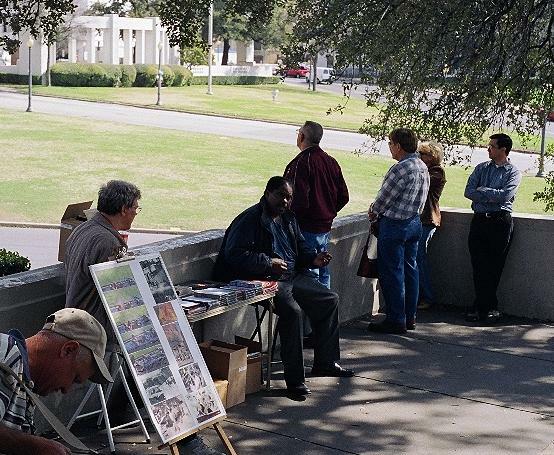 There were many street vendors in the Plaza, selling books, posters and pamphlets about JFK. There were copies of newspapers from the day of the shooting. Lots of vendors were selling books about the "conspiracy" to kill Kennedy and the ensuing cover-up. In the decades since the shooting, the assasination has become something of a cottage industry. Writers have made careers speculating on the motives behind the shooting and hawking their pet theories. The stories of many "witnesses" kept getting better and more elaborate over the years, as people cashed in on the shooting. The infamous Texas Schoolbook Depository building as it looked in 2004. The window Lee Harvey Oswald shot from is second from the top, on the corner above the entrance to the building. The Sixth Floor Museum upstairs tells the story of the event. The tree at left has grown since 1963, and now obscures what would have been Oswald's line of fire from the window. Otherwise, the Plaza was very much like it was on that awful day. That's me in the Plaza, across Elm Street from the Grassy Knoll. Just off my right shoulder, you can see a chalk "X" in the roadway. That's marks Kennedy's location when he was shot. The Grassy Knoll. 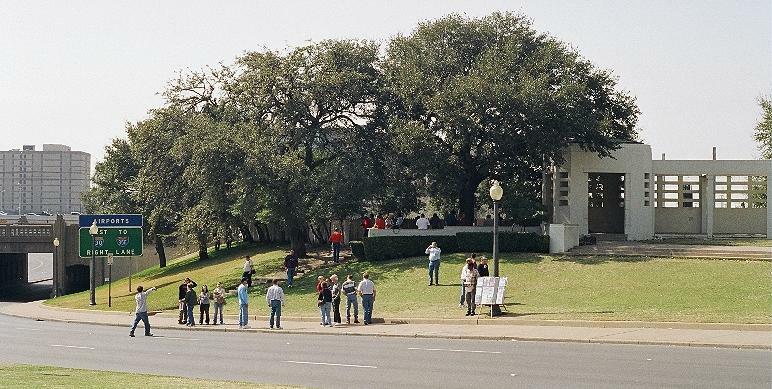 In my picture, you can see people looking over the wooden fence in the back-- the fence so many conspiracy theorists say hid the "real" shooter of President Kennedy. There were people on the Knoll that day watching the motorcade, just like these tourists; it wouldn't have been any trouble at all for them to turn around and see somebody back there... and you'd think they would have noticed somebody pointing a sniper rifle. Even if the witnesses were on the sidewalk, it would've only taken a couple of seconds to run up and look over the fence. There's no way a shooter could've hidden from people in the Plaza. He would have been seen. To the left is the Triple Underpass bridge where some witnesses said they saw "a puff of smoke," which conspiracy theorists claim proves there was a shooter in the area. Never mind that smokeless gunpowder had been around since World War II. Never mind that there's train tracks there, and it could have easily have been steam drifting by. A conspiracy smart enough to orchestrate the assasination of a president would have thought ahead and not used anything that would pinpoint their shooter's location. A puff of smoke? What was he using, a blunderbuss? This is what the Plaza looked like from the Grassy Knoll, not far from where Abraham Zapruder filmed his historic movie of the shooting. The Schoolbook Depository building would be back off to the left, out of the picture. The film shows the motorcade passing through the Plaza down Elm Street towards the Triple Overpass and right in front of this spot. That's really how close the street is. In the center, next to the tourist's head, you can see the "X" in the road where the fatal shot hit. I took this picture from behind the wooden fence. If there had been a second shooter there that day, this is how the Plaza would have looked to him. This would have been his field of fire. It's shady there on the Knoll. It's logical to assume that people waiting to see the presidential motorcade passing by would have been sitting right there, maybe even right up against the fence, where any bad guys would have been seen. That's the problem with this second shooter theory. Bad guys don't like to be seen. Bad guys avoid witnesses. Bad guys planning to shoot from this location would've known the possibility of getting spotted was too great to risk. This is a terrible shooting position. Even if the shooter was hidden, the bystanders could still block his shot. An assassin planning to shoot from that location would have had no way of knowing how many people might be standing right there in the line of fire, spoiling his aim. Even if the shooter had a clear view, he'd only have a split second to take his shot as the car sped by --and any shot he took would have given away his position. If there had been several assassins in the Plaza that day, as some writers theorize, and if the goal was to kill Kennedy, they would have all shot at him. Why not? They would not have cared who else in the car got shot, they would not have cared how many bystanders got hit in the crossfire, and they would have fired all their bullets to achieve their goal. (For example: when Egypt's Anwar Sadat was assassinated in 1981, the attackers killed him and seven people standing near him.) 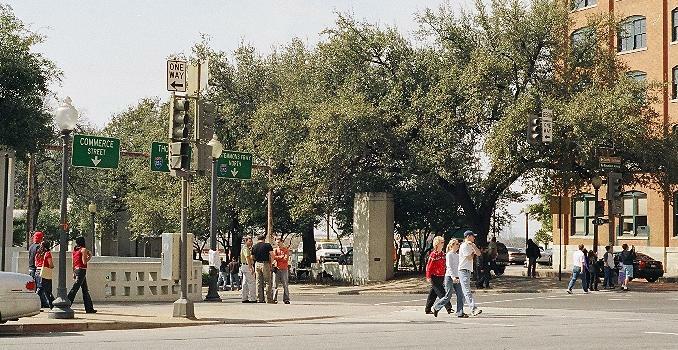 Dealey Plaza would've been a shooting gallery-- and that did not happen. What happened was: three shots were fired, just enough for one shooter (Oswald) to get off before the target (Kennedy) got out of range. In the background, you can see cars parked behind the depository building. (In fact, that's where I parked my car that day.) That's what's behind the fence behind the Grassy Knoll-- a parking lot. A big, empty space. If there had been a shooter behind the fence, there wouldn't have been anyplace for him to go, no place to hide. A witness could've just peeked over the fence and seen someone escaping. A professional hit man would have known that. The first rule of crime is to get away with it. Unless they were going to be teleported aboard an orbiting spaceship, anybody planning to shoot from that position would have realized there would be no way to escape undetected. When Oswald fled from the building after the shooting, he was seen by various witnesses before his inevitable capture. All of these facts add up against the idea of a conspiracy, and instead suggest something else: the actions of a lone, pathetic, short-sighted gunman, acting on his own. If some shadowy group wanted to kill Kennedy, why do it in Dallas? Why not in Washington DC, or California, or while he was giving a speech on TV? Why not poison him, or use a bomb, or make it look like an accident? If they were all that powerful, they could have killed him anywhere; why do it there? The answer is simple. There was no shadowy conspiracy. 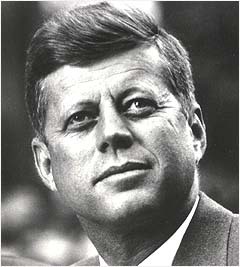 Kennedy was shot in Dallas because Lee Harvey Oswald lived in Dallas. 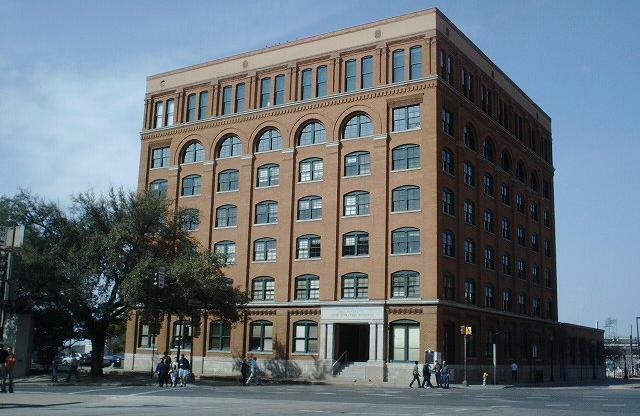 Oswald fired from the Schoolbook Depository building because that's where he worked. He had a rifle and knew how to use it. Oswald was a loser who wanted to feel important, and he did it by shooting the most important man in the country. That's opportunity, method and motive, all you need to convict someone of murder. It's really just as simple as that. The hard truth is that, sometimes, all that's needed to change history is one very, very determined individual. Unfortunately. The idea that there was a secret government plot to kill Kennedy, kept hidden for decades by a vast conspiracy, is absurd. I've worked in municipal government most of my adult life, and I can testify from personal experience that the inner workings of government are much more like the comic strip Dilbert than The X-Files. It would take too many people to keep a lid on things, and with that many people there's no way it could be kept secret. (Remember: this is the same government that couldn't keep the Stealth bomber a secret.) The threat of death doesn't stop ex-gangsters from testifying in court, so it wouldn't stop somebody from spilling the beans after all this time. The whole conspiracy thing hinges on there being a second shooter on the Grassy Knoll. I don't think there was one. I honestly can't see how there could have been. The evidence shows the fatal shot came from behind and above Kennedy, right where Oswald was. The evidence doesn't show any proof of anybody else shooting at Kennedy. The argument for a conspiracy just doesn't work. Conclusion: Oswald did it, and he did it alone. I'm sure some will disagree. I'm sure people will be arguing about this for a long time. For me, however, the mystery was solved, and the case was closed.